Click on a question below to get your answer. ?-Where can I see one in person? You are always welcome to visit our shop. We have a few demo models we can show and usually have several trailers in the process of being built. We do have several generous customers across the country who are willing to show their Camp-Inn. Please email or call us with your address and phone number and we will put you in touch with a customer near you. Please specify which MODEL (560 Raindrop or 550 Teardrop) you are most interested in seeing. ?-Why should I buy a Camp-Inn teardrop instead of a pop-up? Kitchen has 4-5 feet of counter top Does the table count? Extra gear accessible at wayside stop You can't get anything unless you "pop-up"
?-Can I pick mine up?/Does Camp-Inn ship? We encourage our customers to pick up their new Camp-Inn teardrops. That way, we can make sure that the hitch, ride height, and tow vehicle wiring is correct. We can also answer any questions about the design or how things work. Plus, we always enjoy meeting our customers in person. If you pick up your trailer you will save the shipping charges. If you apply those savings to your trip expenses, it is like getting a vacation paid for. Also, you can enjoy your new Camp-Inn on the way home. There are hundreds of things to see and do in Wisconsin and on your way home, so make picking up your new Camp-Inn into a real vacation trip. If you cannot pick up your trailer, we will gladly ship it to you. We have shipped to all areas of the US and even overseas. We will try to get you the lowest total shipping cost. Please contact us to get a shipping quote. ?-How much does one cost? That depends on what features and options you would like on yours. Check out our Models, Features, and Options pages to determine what you would like. Then go to our Pricing page to estimate the price of a Camp-Inn with the features you want. ?-Why are your trailers more expensive than your competitors? We get asked this quite often. Most of our competitors' "top of the line" units are similar in features and options to our more basic packages. We offer packages and options that go far beyond what our competitors offer. Comparing our "top of the line" to their "top of the line" is not an even comparison. We use mostly marine-grade materials, hardware and components... not the cheaper RV stuff. ?-How do I determine ride height? 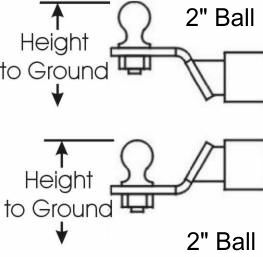 Camp-Inn trailers use a 2" Ball for the hitch. The standard ball height for a Street model is 14 inches. The standard ball height for an SUV package model is 17 inches. Ideally, the tow vehicle's hitch should be at approximately the same height. Add about 150 lbs to the trunk or rear of the tow vehicle to simulate the tongue weight before measuring hitch height. If your hitch is within two inches of the ride height, (12-16 inches Street, 15-19 inches SUV) it will be close enough to make the trailer look level. More or less will make the trailer ride nose high or nose low, respectively. This doesn't hurt the trailer, but it doesn't look as good. We recommend setting it either level or nose high by about one inch. Then, if you want to sleep in the trailer without unhitching it, you won't be sleeping "downhill". If you have a receiver type hitch, different offset hitches are available to help adjust hitch height. Contact us if you would like a non-standard ride height. ?-Why is the Storage Cover so expensive? This is the most common question we get about the storage cover. We have the storage cover custom made to fit your trailer. It is made of high quality material. It is UV, mold and mildew resistant. It is waterproof but still breathes. It is the best material on the market for this application. We had to choose whether to make a more expensive, high quality cover or try to make a less expensive one of lesser quality. Since the sewing labor costs the same, regardless of material cost, reducing the material price by half will only reduce the finished price by 20-30%. Plastic tarps do not breathe and cause condensation inside. This will cause that musty smell from mildew. Cotton covers do breathe but are not waterproof. Neither plastic nor cotton covers are durable over the long term. ?-What do I do with the kids? That depends...how many do you have and how big are they? The Camp-Inn 500 and 550 will fit two adults and a small child. The 560 Raindrop has bunk beds for two smaller children and a queen-size bed for the adults. If you have teenagers, they can stay in a tent and the adults can stay in the Camp-Inn. They want a little privacy, and you don't have to sleep on rocks. If you have a large family, the Camp-Inn gives you the extra room to haul along sleeping bags, lawn chairs, and everybody's gear. You have a kitchen for large meal preparation. The extra storage area leaves the car's trunk free for day-trip supplies. ?-What if I'm really tall? Answer: It may be hard to believe, but the Camp-Inn 500's and 550's have a queen-size bed. That's 6 1/2 feet long and about 5 feet wide! If that isn't enough, the 560 model has a couch at the front that can be dropped down so the cushion is flush with the mattress. If you put your pillow on the couch, it effectively makes the bed about 8 feet long. ?-How do I cook if it rains? Camping with a Camp-Inn is similar to tent camping. Personally, I have a quick set-up type canopy that I can place over the kitchen area. Screen-tents can be modified to fit over the kitchen area as well. You can store all this extra equipment in the Camp-Inn's sleeping area during travel. P.S. It works well for sun too. ?-Why not put a dinette inside? Unlike other compact travel trailers, a teardrop bed does not double as a dinnette. It is possible, and there have been teardrop builders that have tried to do it, but it has a couple of major drawbacks. You would have to unmake and make the entire bed every time you wanted to use the dinette. The foot area would have to be lowered to make comfortable seating. This would reduce ground clearance and eliminate under-floor storage area. Although it would be nice to have during bad weather, due to the compactness of the teardrop, you would have to stand outside to set up the dinette or make the bed. Home builders that have included a dinette use it once or twice and decide it is too much trouble. ?-What do I do with my shoes? Reserve a spot on the duffle shelf. You can line it with plastic or have a bin for them. Have a plastic bin, with a lid, that you can put them in and slide under the trailer. Get one of our side entrance tents. ?-Why not put a deck for hauling stuff on the tongue? The teardrop design is a design of efficiency. It balances well and is aerodynamic. If you add a deck to the front for hauling firewood, ATV's, motorcycles, etc.it throws off the balance. Putting a deck on the front forces you to extend the tongue and thereby increase the tongue-weight. If you load anything onto the deck, most of the weight is put directly on the tongue. If you put a 400 lb ATV on the deck, you would add about 250 lbs to your tongue-weight. If the empty trailer had a 150 lb tongue-weight, this would make your total tongue-weight about 400 lbs. You would need a large SUV or truck to safely carry that tongue-weight. If you moved the axle to adjust the tongue-weight, the unloaded trailer would be improperly balanced. Adding a deck to the rear does the opposite. Adding too much weight to the rear makes tongue-weight too light and causes the trailer to sway and handle unsafely. ?-How do I tell if this is really for me? Trust us...It's for you. Seriously...The Camp-Inn Teardrop Camping Trailer is not for everyone. The Camp-Inn is a step between tent camping and RV camping. It has some of the benefits of both. If you have to bring along a vacuum cleaner...It's not camping. ?-It looks so small and I'm kind of claustrophobic! The Camp-Inn is actually bigger than it appears. The cabin holds a queen-size bed and has 3 1/2 feet of headroom. Someone 6'5" tall can sit on the bed and still have plenty of headroom. It is similar in size to the inside of a mid-size car (without the seats). ?-What about a heater or air conditioner? HEATER: We have found that a Camp-Inn teardrop doesn't require a heater unless the temperature is very cold. They are insulated and weather tight, so usually body heat is enough to make it comfortable within a short time. In cold weather, bring along an extra blanket and you will be surprised how warm you stay. In most cases, a small DC heater is more than enough to take the chill out of the air. If you camp at campgrounds with hook-ups you could bring along an electric heater or even an electric blanket. That said, we have designed a heater option for those who do cold weather camping and want to make sure they have a warm, dry place to sleep. Go to the Options page for more information on this option. AIR CONDITIONING: A teardrop, tent or automobile sitting in the sun will get hot inside. Since you usually won't be sleeping when the sun is out, the main issue is hot nights. With both side windows open, you get cross ventilation. With the sunroof option, you get even better ventilation. If you decide you still want AC, we have designed the air conditioner option. Go to our Options page to view pictures of this option. The air conditioner is mounted inside a drain pan that has a drain pipe plumbed through the cabin and out the bottom of the trailer. This allows any condensation to drain safely out of the trailer. This drain pan also drains out any rain water or wash water that gets into the external air conditioner vent area. ?-Can I get it with a shower or toilet? We do offer a portable shower that you can use at your campsite. Please call us for details. There is only so much room to fit it all in and the toilet is one thing we had to leave out. Also, we decided to leave it out since most campsites have some type of toilet. Camper toilets are a smelly nuisance at the best of times, and worse if not maintained and serviced properly. You can take a port-a-potty with you, if necessary. Consider our Side Tent Option for a private place for the port-a-potty. ?-What construction methods does Camp-Inn use? Unlike standard RV's and pop-Ups, Camp-Inn uses marine-grade plywood and solid wood. The solid wood is either maple or pine. No particle board, chip board, or fibre board are used. All wood parts are thoroughly coated with marine grade varnish before final assembly. Even if you can't see it. Body joints (like where the wall meets the floor or one wall meets another) are gusseted, glued and screwed together for strong joints. Camp-Inn Teardrops are built with long life, low-maintenance and durability in mind. ?-Why don't you use painted steel fenders? The fenders on any trailer receive a lot of punishment. Stones and road debris are thrown up from the tow vehicles tires and hit the fenders, even if you only drive on paved roads. It doesn't matter how good your paint is or how slow you drive: painted fenders will chip and rust. Our original prototype used painted steel fenders, similar to most of our competitors. After driving down about 20 miles of gravel road, the front of the fenders were sand-blasted. The fronts of the fenders were chipped and pitted from stones thrown up by the car's rear tires. The fenders looked bad and after one rainstorm, rust started forming in the pits. We realized that in order to keep it looking good, the fenders would have to be repainted. Instead, we went with two low-maintainance options: lower-cost, high-impact plastic fenders and more expensive stainless steel fenders. The plastic fenders are a virtually indestructible fender that will take bumps, scrapes, stones and debris without breaking or chipping. For the coustomer that is more concerned with styling, we have our custom-designed stainless steel fender. This fender is not painted so it won't chip or peel and it will not rust. It is easily cleaned and looks great for years to come. ?-Why don't you use gas struts on the hatch? Short Answer: Because they don't work well for this application. Long Answer: The way that gas struts work is they use a compressed gas pushing on a piston to open and hold open the hatch. The problem with gas struts is that they need to be cycled (opened and closed) on a regular basis (at least a couple times a month). Every time you cycle a gas strut, the seals are automatically lubricated with a small amount of oil. This oil helps the seals work properly, keeping the compressed gas inside the strut. If the gas strut is not cycled regularly, the seal dries out and the compressed gas slowly leaks out. When the compressed gas leaks out, the strength of the gas strut is reduced. In the case of a rear hatch on a teardrop, the hatch may remain closed for several months at a time, during winter storage, giving the seals plenty of time to dry out and allow the compressed gas to leak out. After a storage season or two, enough compressed gas leaks out that the gas strut does not have enough strength to hold the hatch open (especially in cooler weather). At Camp-Inn, we invented an automatic mechanism to hold the hatch open. The hatch prop mechanism automatically engages when you open the hatch. Just open the hatch and the prop rod slides into place. Release the hatch to lock the prop rod into place. To LOWER the hatch, simply lift the hatch to unlock the prop rod and, using your other hand, gently slide the prop rod inward as the hatch is lowered. Click Here for an animated picture of our automatic hatch prop mechanism. ?-Can I get a built-in fridge -OR- Are those coolers under the counter? We are often asked these two questions and they are so similar that I will answer them together. First, it would take up valuable storage space. If the cooler was built-in, you would lose that space for other items such as pots, pans, or food. By using a portable cooler hauled on the countertop, the cooler can be moved to make more counter space. The same area serves double duty. Second, built-in coolers are hard to clean. A portable cooler can be taken out, dumped upside down and hosed out if necessary. Third, Portable coolers are...well...portable! If you want, you can take them in the car for a day trip or into a park for a picnic. ?-Can I use a DC cooler? DC fridges draw a lot of current and will drain your battery quickly. Since most of these coolers use over 7 amps, even if you have a larger battery (72 Ah) it will only run for 8-10 hours on a charge. Many customers use an 80-100 watt solar panel to charge the battery when camping remotely. Most DC coolers have an AC adapter, so if you have the AC/DC option and are at a campsite with hookups, you can run your cooler on the AC outlet. During travel, you can run the cooler in your tow vehicle -or- if you have the tow vehicle charging option, you can run the cooler in the teardrop kitchen. Our cooler area is sized to fit several of the more popular DC cooler/fridges. ?-What size cooler will fit? 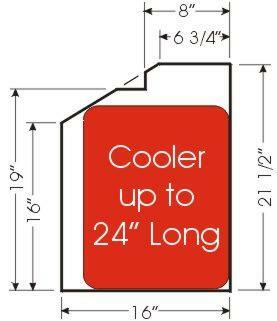 Our cooler area is sized to fit most of the more popular coolers, and DC coolers/fridges. Because of the sloped rear hatch, we can't give a single dimension. The best approach is to draw the outline, shown here, on a piece of cardboard. Then hold the cardboard pattern up to the end of your cooler. If your cooler fits inside the outline and is 24" long, or less, it will fit. ?-Why would I want an 11 lb propane tank? 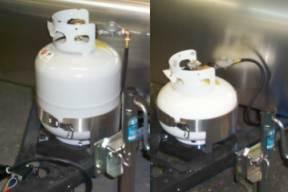 The question is often asked...Why would I get the 11 lb propane tank if the 20 lb tank is the same price? A full 11 lb tank weighs about 15 lbs less than a full 20 lb tank. Since the tank is mounted on the tongue of the trailer, almost all of it adds to tongue weight. With smaller tow vehicles, this is a very important consideration. We have found that cooking 2-3 meals a day and washing dishes once a day, you will use slightly over 1 lb of propane. So an 11 lb tank should last 7-9 days. Our tank mount bracket will fit either tank. For longer trips, just swap the 20 lb tank off your barbecue grill at home. That way you can exchange it along the way, rather than refilling. You can take the 11 lb along for a spare or leave it at home to save weight. Styling. The smaller tank is more proportional to the size of the trailer. It's just cuter! ?-Do I need to title and license it before picking up? If you are driving straight (or relatively straight) home, you do not need it titled or licensed for the trip home. You will be given a dated bill of sale and an MSO (Manufacturer's Statement of Origin). If you are stopped, present these to the officer as proof that you have recently purchased your trailer. Also, if you are not in your home state, the officer can't ticket you for not having a plate, since they can't enforce other states' laws. If you are planning on taking the "scenic" route home, you may want to get your title and license ahead of time. Contact us for info on how to do this. You should always check with you insurance company to make sure your trailer is adequately covered for the ride home. ?-Do I have to pay Wisconsin Sales Tax? 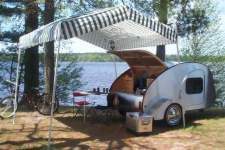 If you pick up your Camp-Inn teardrop, you will have to pay 5.5% sales tax in Wisconsin. 5.5 % sales tax paid to Wisconsin when you pick up your trailer. 2.0 % sales tax paid to California when you register your trailer. 7.5 % TOTAL sales tax paid. If you have your Camp-Inn delivered or shipped to you, you will not have to pay any sales tax to Wisconsin, but you WILL have to pay the full amount of your local sales tax (7.5 % in example above) when you register your trailer. If your local sales tax is lower than 5.5%, or you have no state sales tax, please contact us and we may be able to arrange a pick-up or delivery option that will minimize the sales tax paid. ?-Can I charge the trailer battery from my car? The trailer must be wired for it. Your tow vehicle must be properly wired for it. TRAILER: All Camp-Inn trailers come wired with a 7-prong trailer connector (6 around 1). This is an industry standard for trailers. One of the prongs is connected to +battery and one is connected to -battery. This allows for charging of the trailer's battery any time it is connected to the tow vehicle and the tow vehicle is running. TOW VEHICLE: Your car or truck must be wired with the 7-prong connector and should have a battery isolator installed (see the following question for more information on battery isolators). If your vehicle came equipped with a 7-prong connector, it may or may not be wired for charging. Check with your mechanic to determine if it is properly wired. Aftermarket battery isolators and 7-prong connectors can be installed on almost any vehicle. Check with your mechanic or RV service center to have this done. If you feel you can do the work yourself, contact Camp-Inn if you need help finding battery isolators or connectors. ?-Do I need a battery isolator? A battery isolator is basically an electrical switch that connects the trailer's battery to the tow vehicle's alternator when the alternator is charging (engine running) and disconnects it when the alternator isn't charging (engine off). A battery isolator prevents you from draining the tow vehicle's battery when you are using the trailer DC (So you can start your engine in the morning). You can achieve the same result by unplugging the trailer connector every time you shut off your engine and connecting it after you start the engine. But, if you forget to disconnect it, you may have a dead battery; and if you forget to reconnect it, you won't have tail lights or trailer brakes. The battery isolator can be installed in the trailer or in the tow vehicle. Camp-Inn offers a trailer-mounted battery isolator. Consider the following pluses and minuses when deciding whether to have the battery isolator mounted in the tow vehicle or teardrop trailer. Plus: Tow vehicle may already be equipped (comes with some towing packages) Check with your auto dealer. ?-How do I wire the 7 pin connector? ?-Do the air conditioner or AC outlets run off the battery? Inverters are electronic devices that convert DC power (battery) to AC power (used in our homes to power appliances like toasters, hair dryers, or air conditioners, to name a few). So, it would seem logical to include an inverter in a teardrop. The problem with AC appliances is they use alot of power. For example, if you were to run the air conditioner off the trailer's battery, it would drain a fully charged battery in less than 1 hour. If we did install an inverter, the size would be critical. It would be too big for some people and too small for others. For example, if we put in an inverter large enough to run a hair dryer, it would be like putting a V8 engine on a skateboard for the person who wants to recharge his cell phone. Hair dryers use more power than the air conditioner. Using the hair dryer for ten minutes would use about 1/3 of the battery capacity. If we installed a medium size inverter, some people would overload it and it would still be overkill for others. We could install a smaller inverter to run laptops, recharge cell phones, etc. These smaller inverters are inexpensive and readily available at auto parts stores, electronics, hardware and department stores. They are made to plug into the cigarette lighter port in your car (and the DC ports in your Camp-Inn trailer). We recommend about a 100W inverter. We locate our battery under the countertop at the rear of the trailer, on the curb side. This location is near the axle so it does not add tongue weight. It is behind a removable access panel for protection. ?-Can I add custom electronics? We install many custom electronics on a special order basis. Contact us about any equipment you may have in mind. ?-What type of vehicles can tow it? Since the Camp-Inn 550 models weigh between 800-1100 lbs and have a tongue weight of about 130-160 lbs, the Camp-Inn can be easily towed with a mid-size car or larger. Most four cylinder cars are able to tow a lightly loaded Camp-Inn. The 560 model weighs about 1200-1300 lbs and has a 165-170 lbs tongue weight. For the 560 we recommend a 6 cylinder car, small SUV, minivan, or larger vehicle. Check with your auto dealer to find out the towing specifications for your vehicle. (the trailer's weight varies depending on model and options) Contact us if you are concerned about the trailer weight and we will discuss how to keep the weight down. ?-Do I need electric brakes? This answer depends on where you live and what kind of tow vehicle you have. A few states require electric brakes for trailers the size of a teardrop. If you have a smaller tow vehicle, or plan to do driving in mountainous areas, you may want electric trailer brakes even if they are not required by your state. ** Must be able to stop within 40' at 20 m.p.h. This may spark another question...If my teardrop weighs less than 1000 lbs, do I still need brakes? The weight listed above is the gross weight (gross weight equals the weight of the trailer plus the weight of the cargo...food, gear, water, etc.). Camp-Inn trailers are designed and rated at gross weight of 2000 lbs. Here's the tricky part...Camp-Inn can reduce the gross weight rating of the trailer. We don't do anything different building the trailer, but when we stamp the manufacturer's tag, we stamp in 1500 lbs instead of 2000 lbs. The trailer is still CAPABLE of a gross weight of 2000 lbs but LEGALLY it can only have a gross weight of 1500 lbs. So if your Camp-Inn trailer weighed 900 lbs empty, you could LEGALLY carry up to 600 lbs of gear (1500 - 900 = 600 lbs). For example: If you are from California, and don't want electric brakes, Camp-Inn is required by law to limit your gross trailer weight to 1500 lbs (even though the same trailer in Wisconsin would have a gross rating of 2000 lbs). The electric brake option is equipped with a breakaway switch system. Most states that require brakes also require breakaway switch systems. The breakaway switch applies the brakes if the trailer accidently becomes unhitched from the tow vehicle (It is not a parking brake). The brake option requires an on-board battery that operates the brakes, since the electrical connector will disconnect shortly after the trailer becomes unhitched. The battery must be charged by the tow vehicle. If you need or want brakes, please check the electrical section of FAQ and read the question about charging the battery. ?-Will I be able to see around the 5 foot wide trailers with my car? All states require you to have two mirrors capable of seeing behind you. If you have two side mirrors, here is an easy test: Roll down the windows and measure between the inside edges of the mirrors. If it is greater than 5 feet, you will be able to see past a 5 foot trailer without extension mirrors. If it is less than 5 feet or if you don't have two side mirrors, you will need trailering mirrors or mirror extensions. These are available at most auto parts stores. ?-How does loading affect ride/tongue weight? It depends where you add the weight. Using the picture above, imagine you were hauling a 50 lb box of rocks*. The following table shows approximately how much effect that 50 lb load would have on different points on the car and trailer. A Roof top carrier 0 lbs. 0 lbs. 30 lbs. 20 lbs. B Car trunk 0 lbs. 0 lbs. 50 lbs. 0 lbs. C Front storage 17 lbs. 33 lbs. 44 lbs. (-11) lbs. D Cabin area 33 lbs. 17 lbs. 22 lbs. (-5) lbs. (above trailer axel) 50 lbs. 0 lbs. 0 lbs. 0 lbs. F Under counter storage 62 lbs. (-12) lbs. (-16) lbs. 4 lbs. As you can see, where you add the weight can affect the ride of the car and trailer. Since a Camp-Inn trailer is rated for 500-1000 lbs. of cargo carrying, you should use it to haul all your heavy gear. The best place to haul heavy items is to slide them into the footwell area of the bed (inside the cabin). As you can see from the table above, it will not affect the tongue weight or load the rear axle of the car. Putting heavy items in the under counter top storage area will actually take off tongue weight.